A behavior chart (otherwise known as a reward chart or sticker chart) helps children understand that it is more rewarding to behave well than to misbehave. Kids initially start behaving well in order to get a sticker on their chart, please their parents and teachers, be praised and complimented or maybe even get a reward for completing their behavior chart. Eventually, good behavior starts coming naturally and kids start reaping the benefits. They start enjoying their relationship with their parents, they love not being yelled at, getting good grades, improving self-esteem, etc. Eventually, children will actually set limits for themselves and want to behave well! There are two kinds of behavior charts on this site: charts that focus on a specific behavior or reward chart templates that can be used for any purpose. Reward or behavior chart templates are very flexible and can be customized to your needs. Most of our behavior charts can also be personalized with your child’s name, goals and photo. All of our charts are free including the customized charts. According to the CDC, a reward program such as a sticker chart can be helpful with young kids. It can help get kids to do things they are not already doing or encourage them to keep doing things they are already doing. It works well for behaviors that become a habit like staying in bed after being tucked in, using the potty or brushing one’s teeth. A reward chart is used to promote and encourage good behavior by placing emphasis on a child’s good behavior instead of focusing on the bad behavior. Studies have shown that praising good behavior is far more effective than reprimanding children for their bad behavior. The problem is that it is much easier to focus on bad behavior since it is difficult to ignore. Sticker charts help remind you to praise good behavior by placing a star or sticker on the chart. This sends a message to the child that he or she is being rewarded for acting in that manner. Your child, in turn, will want to receive more positive feedback so he or she will be motivated to behave in a similar manner. After all, who doesn’t want to be praised? Each time you stick a sticker on the reward chart you are basically taking the time to stop and praise your child. It also makes it clear to the child that he or she is acting in a manner that you appreciate, like and want to reward. It is important that the whole process is fun or else it will not be as effective. 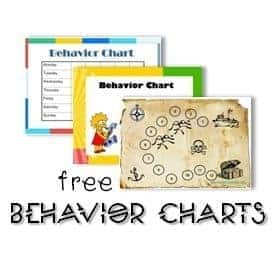 Try to choose a chart that your child likes from our huge selection of free printable behavior charts. Choose a sticker chart together with your child and give it a try. The only thing that you have to lose is your child’s bad behavior! Looking for a chore chart template to keep track of your child’s chore list? We have a huge selection of family chore charts and printable chore charts for girls and boys. We also offer a chore chart maker to create custom chore charts. You will also find articles on how to get your kids to do chores and the ways that chores can benefit kids. We offer a selection of free printable certificates to award your students or children for good behavior, reading, effort, sport or skills. Printable certificates are an excellent way to reward good behavior. Make parenting more effective, rewarding and enjoyable. Improve your relationship with your children. Give you more confidence in your parenting. Correct misbehavior using positive parenting techniques. Help parents who are feeling helpless and frustrated. Increase your knowledge and improve your parenting skills. Get your family to work as a team with common goals. Build positive relationships with the entire family. This site is based on positive parenting techniques. The ultimate goal of positive parenting is to get your child to want to behave well. A selection of feelings charts with a printable list of feelings. These charts can help your students or children express themselves. Our goal is to provide teachers with classroom management tools such as reading rewards, classroom rewards and other free tools to reward and motivate students. We know that you have a really difficult job but we are here to help! If you require additional resources then please comment below and we will try to create them for you! A huge selection of free printable reading rewards to encourage kids to read. You’ll find reading logs to track reading and reading rewards to reward kids who reach their goals. We offer printable certificates and other awards such as book bucks (play money template), bookmarks and more. You are sure to find something that will motivate your children or students to read more! Great site! Keep it up!! I finally found this site after looking for charts like these for hours! I plan to come back often. I just wanted to say thank you for sharing all of the charts. They are very helpful. my daughter LOVES Hello Kitty. It would be much appreicated if you could add a Hello Kitty Reward chart…. I take a chart with me when I go to the mall with the kids. I use a whole chart for a visit. Each time we go into a store adn they are well behaved I give them a star and when they get 10 stars they can choose a small gift or candy bar. Shopping used to be a nightmare and now it is actually fun! Thank you for offering these great reward charts! They will be featured in my upcoming newsletter and I know my readers will find them especially helpful! it works like magic… my kids change almost right away when i use sticker charts… i looooove them…. These rewards charts is amazing changed my kids attituteds like you won’t believe it. Made them responsible and putting them in a heathy routine. Thank you – this is excellent!! These are saved in a different format. You click on them and save the file or print. It is better to save the file and then open it and print as then you don’t get the margin that you get when you print directly. If you prefer the PDF version then let me know which one/s you want and I will email the PDF version to you. Great reward charts! Can you tell me how come some charts have 4 boxes on each day and others five? Do you reward good behaviour after set times… Morning / lunch time / dinner and bed? Or to reward good behaviour as it occurs? I would reward behaviour as it occurs and not at set times so that children can connect their good behaviour with the reward. The number of boxes depends on the child’s age and behaviour. A child with a lot of issues might need to be rewarded more often to keep him/her motivated. You can try different charts and see which work for you. You can also use the free reward chart maker which enables you to add any number of boxes. Hi, thanks for your quick response! My son is 11, and has ADHD. He’s dad and I are keen to try something new and think the reward charts are a great incentive for our son to improve he’s behaviour. I am so glad to hear that! 🙂 It is always nice to hear from people who use the charts! Thanks! great site , thank you , will use more now. A really great site, my daughters love being able to choose a different one each week. I used to have 4 pain in the necks, but since inforcing some discipline and using thses reward charts, my 4 boys have been much better. I let them choose their own, my 7 year old chose spongebob, my 6 year old chose Ben 10, my 4 year old chose spiderman and my 3 year old chose Bob the builder. This along with the time out spot for discipline has definitly been working but I have a question, for my 6 & 7 year olds should I use a time out room because they are older or shall I keep using the time? Thanks. The reward charts are beautiful I love them! hi, i think this site is brill!!! iam soon to become a nanny and i cant wait to use these with the 3 children i will be looking after. fantastic!! Hi! I’ve been having trouble with my 3 year old – he is wetting the bed and also pooing in his pants – it’s driving me and my husband insane – so I’m hoping by using these beautiful reward chart will save my insanity! fingers cross all will go well – thanks from a very stressful mum! I loved this !!! I am sure it will help me a lot , I did started on this without a chart and it is working so far and even better with the charts THANKS VERY MUCH!!! I love this site! My brother can finally sleep without wetting the bed. My mom thinks this site is so cool. I really love the chart maker because my brother loves pokemon. Keep it up! Thanks! These are really basic charts and only have 3 tasks each, will I be able to input the tasks myself ? I added a few charts that you can edit. You will be able to input the tasks, chores or list of behaviors that you are trying to improve. How do I print the charts? Whenever I click on one, it goes to Pintrest?? Really would like to use these charts for my kiddies! Kym, you have to click on one of the corners of the image and not in the middle. If you still cannot open it please let me know. I’m so glad we could help. Good Luck! So glad that I found your website! I saw that if we needed something specific to ask, so I am going to ask :). Any way you can do a reward chart (similar to the BMX one) with a snowboard? Maybe 15 steps? That would be SO wonderful!!! Thank you in advance .